When an idea grows far beyond its original conception, develops its own culture, factions & internal dynamics, and through implementation compromises with the real world, it can become the very enemy of the original idea. Just as Marx would have been horrified at Stalinism, Adam Smith disgusted by today's capitalism, so proponents of Bitcoin's ideals should now be distancing themselves from what Bitcoin is becoming. But all of these arguments are soft compared to the problem of Bitcoin's energy consumption. This Bitcoin energy consumption index estimates (November 2017) Bitcoin uses more energy than the country of Ireland, and is rampaging up the country index; there is no meaningful upper limit on the power it could consume as it grows. While many such as Andreas Antonopolis predicted that the crypto-economy would be an ecosystem of many currencies, in the last six months we are seeing the opposite tendency as Bitcoin's dominance (over other cryptocurrencies) is increasing. It is clear that, like the US finance sector under Alan Greenspan, Bitcoin is optimised to grow, and has no capacity to regulate itself with respect to wider global concerns such as the environment. "Bitcoin launched private currencies into the mainstream, but it’s time to admit we made a mistake in not estimating how environmentally damaging it would become at scale," explains the original ‘Professor Bitcoin’, Dr Jem Bendell. 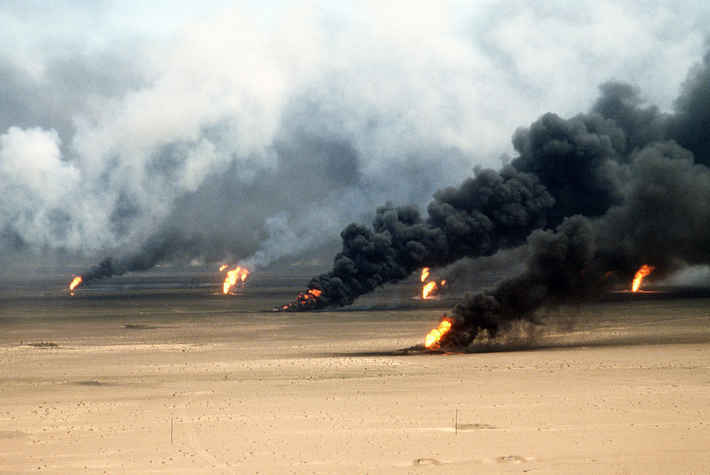 That means Goldman Sachs' optimism about Bitcoin's price should be read not as cause for celebration but as the herald of an environmental disaster, comparable perhaps to the Kuwaiti oil fires in the aftermath of the first Gulf War. The recent push to adopt Bitcoin Cash to reduce the transaction processing bottleneck does little to reduce wasted energy and would lead to mining being even more centralised. In theory, Bitcoin could switch to a proof-of-stake consensus model, but the vested interests and voters - the miners - would have to volunteer to write-off their own capital-intensive operation. What we can do about this depends on who we are. Investors might diversify their portfolios, weighting more heavily the coins they want to win. Exchanges might create markets between different alt-coins rather than assuming all transactions are either to or from Bitcoin or ethereum. Fund managers could create ethical crypto-funds, meaning they avoid proof-of-work coins. Software developers could focus more on multi-currency support. Governments could distinguish between coins, perhaps continuing to clamp down on Bitcoin now and remaining undecided what to do with other coins. Bendell concludes “Bitcoin has served its purpose and we must move on with smarter and cleaner tech - either voluntarily or with government help”. We have much to thank Bitcoin for. And if getting rich without working was all that mattered then we could go full steam ahead. But in a planetary emergency, we cannot afford to get stuck on unhelpful ideologies. Almost everything Bitcoin stands for can be better advanced by our swarming around newer technologies. Permalink Submitted by Trevor Hilder (not verified) on Tue, 11/14/2017 - 09:52. Yes, Bitcoin is completely idiotic. Although I am active in the crypto-currency space, I have always avoided Bitcoin. It is based on deeply flawed assumptions about what a good monetary system is and the community around it is weirdly anti-social and paranoid. They seem convinced that all government is by definition evil and that gold is a good model for sound money. The historical evidence indicates that the so-called Gold Standard (which was really a Gold/Sterling System) was a very poor monetary system, which only got going outside the UK in 1871, was struggling by 1914 and collapsed by 1931. Chinese fiat paper money started in 1073 and only started to break down in about 1450. The Bretton Woods System was set up in 1944 and was brought to an end by President Nixon in 1971. So both Bretton Woods and our current system have lasted longer than the Gold Standard, but the Chinese fiat money system outlasted all of them by hundreds of years. Amongst these weird Bitcoin enthusiasts, we have Craig Wright, who can't even make up his mind whether he is Satoshi Nakamoto or not. These people are not amenable to reason, but the Bitcoin community is so dysfunctional that Bitcoin will tear itself apart and collapse. I doubt if it will be anything but a historical curiosity within about five years from now. Permalink Submitted by Derek McDaniel (not verified) on Thu, 12/07/2017 - 05:11. Great points, I couldn't agree more. Bitcoin was a real innovator but it has serious design issues, and the environmental concerns alone make it unjustifiable. It is a completely excessive process just to "prove time". I started getting digging into Peercoin a lot back in 2015. Once I understood proof of stake and proof of work, I realized that using a strict "chain" isn't necessary at all, and the security, at least for "proving time" comes from the social effort, not the algorithms alone. Based on the issues involved, I designed trust ledger, which I have shared before. (github.com/derekmc/trust-ledger) Anyway, I am not so much set on a particular coin or system succeeding, but it's very frustrating to see the serious design problems in most systems out there and not see adequate solutions. I think a lot of different systems have made very innovative contributions, like ethereum's contracts, ripple's network, zcash's ring signatures(which I admittedly don't completely understand yet), and much more. I think distributed systems are the future of accounting, and those of us who understand certain technical issues should stay vocal and do what we can to help the better projects succeed, or work to build them. Permalink Submitted by Sango (not verified) on Thu, 03/15/2018 - 14:41. Rather than worry about the value or lack thereof of bitcoin, I would rather engage in extending the MC project to include peer verifiable transaction audits as in blockchain. Most of the requisit elements are there, php support for robust and fast ECC cyrpto, db support for row level security and wat not. Perhaps we can start a fork of mc to meet these goals.